Category: Chevron Found Guilty in Ecuador – Again! Did you hear the stellar news ringing in 2012? The 18-year legal battle over Chevron’s horrific legacy of pollution in the Ecuadorian Amazon has just taken a major step toward justice, as an appeals court ratified an earlier court levying an $18 billion judgment against the company. The decision gives hope to some 30,000 indigenous people and farmers who have been seeking a cleanup of toxic waste sites, clean drinking water and adequate health care. Ecuadorians have won a big victory, but the campaign is far from over. 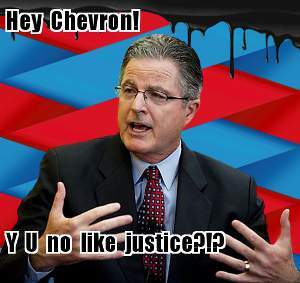 Chevron has made clear what its response will be – more legal stonewalling. The company is mustering ever-larger armies of international lawyers to try to drag the case out in as many legal forums as possible. In the Ecuadorian case alone, Chevron submitted 220,000 pages of documents and 64,000 chemical samples, in what the judges complained was an attempt to physically overwhelm the legal process. And of course the company is still waging a public-relations offensive in the United States, with its spokespeople spinning the story in a desperate attempt to make the company seem like the victim of greedy Ecuadorians and their U.S. supporters. Unfortunately for Chevron’s flacks and lawyers, such excuses are pretty lame. Amazon Watch has been helping lead the campaign for justice in Ecuador for years, but we must admit we do feel for Chevron at such a fraught moment. So much so that we’ve teamed up with our friends at Rainforest Action Network to help the company be a bit more imaginatively shameless and callous. Won’t you join us? Here’s your challenge: Go to this page, pick your favorite Chevron spokesperson, enter the most deliciously outrageous excuse you can conjure up, and we’ll post it to our “Excuse Gallery” on ChevronThinksWereStupid.org.